Flexjet, in red, faces U.S. Polo Assn. in the finals of the 2017 World Snow Polo Championship on Sunday at Rio Grande Park in Aspen. U.S. Polo Assn. won, 5-4. Nic Roldan’s only complaint on Sunday was the relative lack of snow — a sentiment shared by most in the area — but after collecting yet another Most Valuable Player honor, it was just another trivial detail in an otherwise perfect weekend. Roldan, one of the most recognizable American polo players, led U.S. Polo Assn. to the 2017 World Snow Polo Championship on Sunday at Rio Grande Park in Aspen. He topped it off by receiving his fourth MVP award in the five years the tournament has existed. Roldan, who lives in Florida, has long been a December fixture in Aspen. Marc and Melissa Ganzi, who run the Aspen Valley Polo Club near Carbondale, host the tournament, known as much for its glamorous VIP tent as for the elite polo names it brings to town. Among those is Argentina’s Nacho Figueras, arguably the face of international polo, a part-time Aspen resident who co-hosts the showcase with the Ganzis. Figueras and Marc Ganzi joined with Nico Pieres to make up the three-man St. Regis team, easily among the pre-tournament favorites, to win Sunday’s subsidiary over Aspen Valley Polo Club, 8-7. Roldan and the U.S. Polo Assn. team — which included Juancito Bollini and Grant Ganzi, the son of Marc and Melissa — didn’t have to sweat it out like in the thrilling consolation match, which was played after the final. 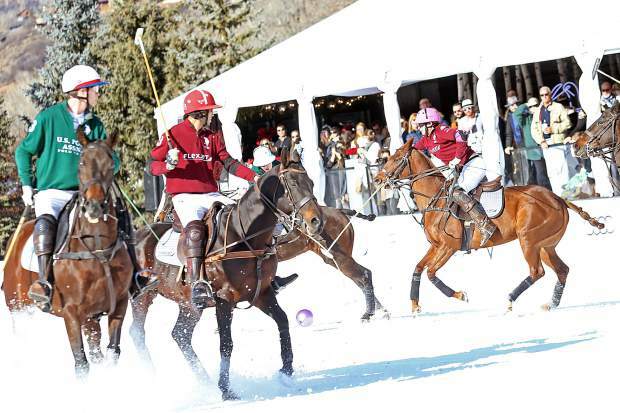 While they only beat Flexjet, the defending World Snow Polo champions, 5-4, most of Flexjet’s points came late. Flexjet included Alejandro Novillo Astrada, Juancito’s father Juan Bollini, and Melissa Ganzi. Melissa Ganzi played alongside Jason Crowder and Jesse Bray, the 2016 MVP, en route to winning the tournament last year for Flexjet. Sunday, she ran into a better team that just happened to include her son. Grant Ganzi credited his team’s defense and ability to rotate players as the reason Flexjet couldn’t find many breakaway opportunities to score. U.S. Polo Assn. led 4-1 at halftime and 5-2 after the third of four chukkers before Flexjet’s too little, too late rally. This was the third straight year Grant Ganzi, Juancito Bollini and Roldan have played together in the World Snow Polo Championship, although they played under the team Audi banner in 2016. The trio also won the 2015 championship with U.S. Polo Assn. Roldan also was part of championship teams in 2013, the inaugural tournament, and 2014.